The decades-long evolution in how we use computers has spawned a parallel evolution in the way we use fonts—and those changes have required the creation of new font file formats. The most popular formats today are PostScript (or Type 1), TrueType, and OpenType. OpenType is the current preferred format because it combines the best qualities of PostScript and TrueType, and features several new capabilities. For example, you can use the same OpenType font file on both Mac OS X and Windows. Also, OpenType supports Unicode, which lets a single font contain thousands of multilingual glyphs—an important feature in today's global publishing environment. Considering OpenType's advantages, many users would like to convert their entire mixed-format font collection to OpenType. Other users seek a way to convert their Windows fonts to Macintosh format, or vice-versa. That's where FontXChange 2.5 comes in. 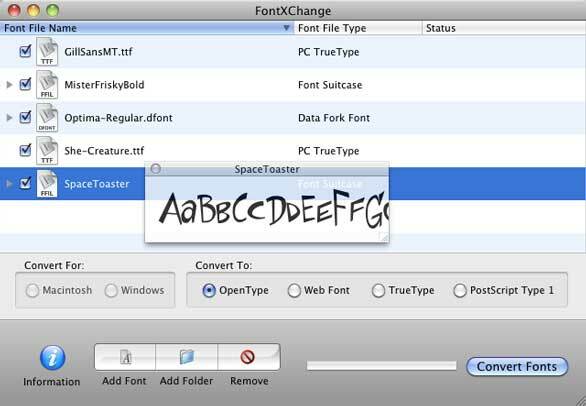 FontXChange is a font format converter with a simple interface that hides an incredibly complex and powerful conversion engine. To use it, you simply drag your existing fonts (or folders full of fonts) onto its window, select an output format, and tell it where to put your new fonts. Each font takes just seconds to convert. If you get confused, just hover over any interface item to see a pop-up tool tip that explains its purpose. The FontXChange interface is as simple as can be. The Preview window is accessed through the Information button. If you click the Information button, FontXChange displays basic information about the selected font, such as its file format, location on your hard drive, file size, and creation and modification dates. If you click the Preview button in the Info dialog, you'll see a sample of the font. For those with more advanced font conversion needs, FontXChange lets you choose the encoding format for the converted file (Adobe, Macintosh, Windows, or Unicode). By default, it chooses the most appropriate encoding format for you. Old Multiple Master fonts can also be converted, as can Apple's DataFork fonts (.dfont), which may be necessary in some publishing workflows. If you have an orphaned PostScript font (one that is missing the necessary bitmap font file), FontXChange can generate a new bitmap font file for you. Although the developer doesn't promote its use as a font fixer, FontXChange can sometimes repair a damaged font, as a side benefit of being rebuilt during conversion. I often use it for that purpose. The biggest change in version 2.5 is the ability to convert fonts to the Web Open Font Format (.woff). This format is being considered as a W3C Web standard, and will likely be adopted. Microsoft, Mozilla and Opera are co-sponsors of the WOFF standard, which will be supported in the next revisions of the Internet Explorer, Firefox, Google Chrome, Safari, and Opera Web browsers. Dozens of font foundries support the standard, including many of the largest font producers. To use any existing font on a Web page, you convert the font to .woff format, upload it to your Web server, and then make CSS calls to it on your Web pages via the @font-face declaration. WOFF fonts are highly compressed and encoded in a way that makes them almost impossible to use for any other purpose. This makes both Web designers and font foundries happy. What about the legality of converting fonts from one format to another? Unfortunately, each font foundry has its own rules. You'll find a handy chart of usage rights granted by 22 type foundries in their End User License Agreements. Notably, Font Bureau and P22 don't allow modification, which means you may not legally be allowed to convert their fonts between formats. Assuming you have a legitimate right to convert a font to another format, you can't go wrong with FontXChange 2.5. Its support for .dfont, Multiple Master, OpenType, Mac and Windows PostScript and TrueType, and the new Web Open Font Format is a huge help for Web and print designers and publishers.